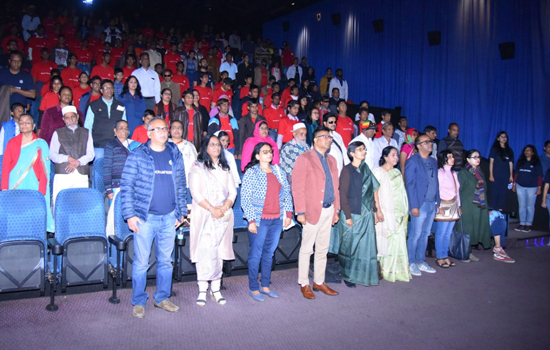 Hindustan Zinc under its “Jeevan Tarang” project organized an audio-described screening of “Hichki’ for the visually impaired people of Rajasthan on 20th January, 2019 at INOX Cinemas, Udaipur. The screening was attended by an audience of over 100 visually impaired children and adults who were accompanied by Hindustan Zinc employees as part of employee engagement program. The company is establishing the culture of releasing these audio described movies and organizing the special screening for visually impaired people with ‘Hichki’ as its 2ndmovie release wherein movie ‘Dangal’ was released last year in same format. In countries like the USA, Canada and Australia, it is mandatory that all films must also release an audio-described version, which plays in mainstream cinema halls. In India, the concept is still evolving and we have very few movies in audio described format that can entertain the movie buffs who cannot understand the portion of movies that are without dialogues. Earlier, the visually impaired could only hear the dialogue portions and during the non-dialogue portions, they wouldn't know what was happening on screen. People with normal sight react to emotions and scenes that they can see, but the visually challenged can't and it is very difficult for them to understand appropriately. Whereas in audio described movies, there is an audio track that describes everything that's playing on screen, in between dialogues with the help of a separate audio track where the narrator describes segments without dialogues. The audio descriptions are also known as a visual description. Chief Guest of the event, Ms. Shuchi Sharma, Secretary Social Justice & empowerment, GoR appreciated the efforts of Hindustan Zinc. She has also assured to extend government’s support in mainstreaming the special students through different initiatives so as to provide equal opportunities to them. Mr. Sunil Duggal, CEO, HZL said “Hindustan Zinc believes in inclusive growth of society. We feel privileged to continue to take some steps to create a more equal world for Persons with Disabilities. We are proud to screen Hichki in a Cinema Hall with an Audio Description, to enable these special children and adults to enjoy the film as much as anyone else. Special thanks to Yashraj Films for producing Hichki in this format, and to the Inox Cinemas for their cooperation. HZL is committed to extend its unwavering support towards a more equal world for all the differently-abled people in Rajasthan”. This year, Hindustan Zinc will also be screening the movie at Ajmer & Bhilwara in INOX cinemas on 27th January and 3rd February respectively. The initiative is in collaboration with the NGO Saksham. Movie ‘Hichki’ is one of the top seven highest-grossing Bollywood films of 2018, as well as the third all-time highest-grossing Indian film led by a female protagonist. It portrays Rani Mukerji as a Tourette Syndrome-afflicted teacher who turns her most daunting weakness into her biggest strength. She is being appointed as class teacher assigned comprises of defiant and impish students who can't seem to keep out of trouble. Despite a few initial hiccups, Naina must do whatever she can to ensure that her students realize their true potential, and defy all the odds against them. “Jeevan Tarang, Zinc Ke Sang”, an initiative to mainstream people with disabilities, was launched on Hindustan Zinc’s 51st Foundations Day; 10th January 2017. It partners with schools and institutions, reaching over 600 differently abled children, who have hearing impairment, visual impairment and intellectual disabilities. The company is committed to extend an unwavering support to make these people self-reliant so that they can become contributing members of their families and live a life of dignity. Hindustan Zinc has also taken a step to strengthen their education by introducing Sign Language training to the hearing impaired & Technology based learning for the visually impaired. Under the project, the company also run various activities & campaigns which gives opportunities of creating an inclusive environment where disability is not considered a hindrance to Education, Being social and Entertainment.